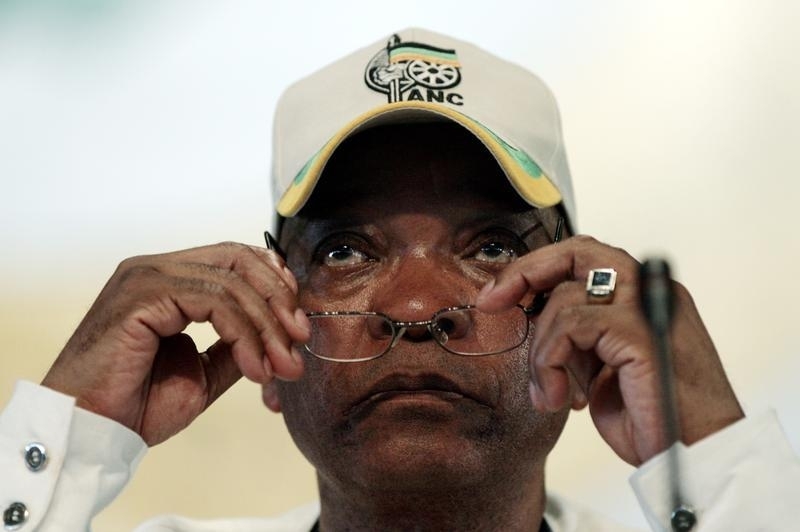 South African President Jacob Zuma could hardly make matters worse if he tried. By firing Finance Minister Nhlanhla Nene this week, he has compounded a toxic mix of domestic and international problems that were already blighting the continent’s second-largest economy. The spiral could get even more vicious. The removal of a finance chief who was keen to rein in government spending has driven the rand to record lows against the U.S. dollar and triggered a drop of more than 12 percent in the country’s banking index. Benchmark government bond yields surged to their highest since 2008, while the cost of insuring against a default jumped. And fair enough. Nene’s dismissal without any clear explanation increases the risk that South Africa might lose its investment-grade rating. Fitch, which cut South Africa’s credit rating to BBB-minus, the lowest investment-grade category, less than a week ago has sounded a negative note about the sacking. Traders are therefore understandably wary of calling a bottom to the local markets until they see how fiscal policy shapes up. There is little to temper such wariness given the $350 billion economy’s myriad domestic problems. Electricity shortages are the most severe since 2008 and cited by the International Monetary Fund as the greatest obstacle to growth. Agriculture is being blighted by the worst drought in two decades while companies have been hit by protracted labor strikes. The international environment is also far from propitious. Weak raw-material prices have particularly hurt a nation dependent on exports of commodities such as platinum and gold. Worse still, international investors are all too willing to lump South Africa in with the likes of recessionary Brazil, and rarely appreciate strongmen meddling with respected finance officials, as Turkey’s experience demonstrates. Having relatively liquid and open markets at such junctures is a hindrance for emerging economies like South Africa since they make it easier for investors to bail. Politicians with unpredictable policies like Zuma are an even worse handicap. South African President Jacob Zuma on Dec. 9 sacked his finance minister, Nhlanhla Nene, without giving any reasons for the dismissal. The rand hit a record low of 15.346 per U.S. dollar on Dec. 10 while benchmark government bond yields rose above 10 percent to peaks last seen in 2008.